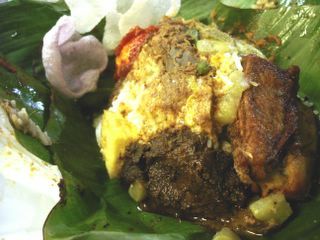 Nasi Bungkus (which literally translates to "wrapped rice"), is a stereotypical Indonesian take-out meal; a mound of rice with small tastes of different items heaped on top, packed conveniently in a folded-over banana leaf for easy carrying as you make your way home through the kampung (village). If you lived in the tropics, there'd be no need for sytrofoam containers either, especially when you've got banana trees growing around you like weeds. And there's also that faint, but fragrant botanical aroma this natural packaging imparts to the steamed rice. Always a plus! Toko Rame, one of the few Indonesian restaurants in Southern California, offers the dish in exactly this manner. Served on a shallow basket made of woven bamboo stalks, the Bellflower restaurant's banana leaf rice parcel looked like a purse with a fat lump of a belly. It's secured shut at the top with a wooden skewer threaded through the leaf like a nose-piercing on a tribesman from Borneo. I pulled out this bamboo spear and the package unfurled, revealing a colorful array of meat and vegetables, tightly packed-in with a football-shaped base of steamed white rice. Sambal Telor: What looks like a giant red eyeball covered in veins is actually a hard boiled egg, deep fried in hot oil to create a lacy, blistered skin. The egg is then stewed in a brew of chilis and tomatoes. The main function of this item is to soothe the palate from the fiery onslaught of the other entrees, although it is itself, spicy. Rendang: This is a chunk of beef braised in coconut milk, intensely spiced with lemongrass and turmeric. The meat falls apart in tender strands with a gentle pull of a fork. The flavor is deep, earthy, and bold. The Yang to the Yin of the rice. Sambal Goreng Ati Rempelo: It's a lip-burning, throat-constricting, caustic stew of chili, potatoes and chicken liver. Easily the hottest item of the bunch. The potatoes crumble pleasantly, but the small chunks of chicken liver chewed and tasted like pencil erasers (the only misfire). Ayam Goreng: A small cut of salty, marinated chicken thigh is fried to a golden crisp. Indonesians like their chicken well-cooked and dry, until you can't tell dark meat from white, and this one is no different. Tahu Goreng: Simply, a cube of fried firm tofu. Another mild item to give the tongue a break from the spice lashing. Lodeh: A douse of soup with cubed chayote, peas, and green beans simmered in a thin coconut curry broth. The chayote has the color and texture as soft as honeydew melon but without the sweetness. The heat level of this dish caused a gushing geyser of sweat to cascade off my brow. Even as I write this review, beads of perspiration are forming on my scalp as I recall memories of that meal. This is a common reaction when I eat cuisine from the region of Sumatra called Padang. The cooks there are known for their fiery foods, with flavors that are razor sharp, vibrant, and sometimes, a little funky. It's the kind of stuff that I taste in my gurgled belches hours after the last bite. The second dish we tried that night was tamer, but not by much. 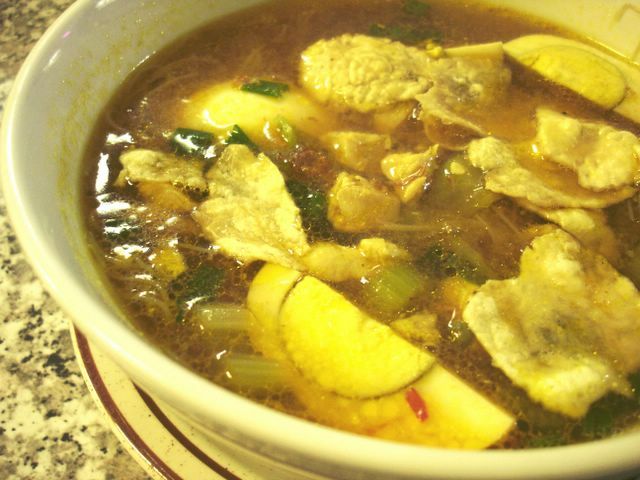 Soto Ayam Kudus is chicken soup seasoned with turmeric and other spices, made zesty with a squeeze of lemon juice. The color of the liquid is bright yellow and is customarily eaten with rice already immersed in the broth. Toko Rame serves the rice on the side, but the soup is still authentic. But being a stickler for things I grew up with, I still prefer the rendition of soto from my hometown of Semarang which is more subtle and uses the jelly-like bean thread noodles instead of the firm "rice stick" noodles utilized here. The quartered hard boiled egg and the fried emping (melinjo crackers) were a nice touch to the soup, the latter acting like those saltines people put in their Campbell's Chicken Noodle. These "chips," made from melinjo nuts, have a pleasant bitter taste that cuts through all the other flavors. This dinner transported me to an exotic place; a bustling thoroughfare jammed with beeping mopeds weaving around street vendor carts, billowing palm trees, and the balmy sweet tropical heat of Java. We paid the meager sum for our meal (cash only) to the owner, a woman wearing a hijaab and her twelve-year-old son, who was our server, and left the small, spartan dining room to the parking lot, ambling out in a food-induced stupor. We were in a dingy strip mall on Bellflower Blvd. A few yards away, traffic swished by on the 91 freeway overpass, oblivious to the fact that the culinary delights of a tropical archipelago is just an exit away. Excellent review, elmo. The last time I had Indonesian food was back in 1996 in NYC. It was great. Now I know of a place for J. and I to try for a quick, yet exotic, lunch. BTW, I am continually amazed that Bellflower has some of the best little holes in the wall for food. Who'd of thought? You said you were "transported" by Toko Rame, but your vivid post made me feel I was "already" in Indonesia! I could literally feel humid air and steam hissing up from the dense jungle floor when I read about your meal presented as a banana leaf package sewed shut with the bamboo skewer. Your description of sambal telor made me feel like I was in the movie Indiana Jones, and the egg was some sort of "cursed" eyeball! Also, that was a wonderful description of chayote for those who have never had it before. I'm so glad I found your site, your posts are so much fun! Happy New Year to you and J. as well! Toko Rame is definitely one of those places you don't expect to find unless someone points it out to you. I actually had been there in the past when it was under different ownership. I think the new owners, who are Muslim, have done a better job at the food. BTW, they are what's called "Halal", abiding by strict guidelines of food prep by their religion. Thanks so much for your praise. I am glad to have been able to share this experience with you. And you're right about the "Indiana Jones" aspect of it. That egg definitely will raise eyebrows if you didn't know what it was. Toko Rame definitely cooks exotic food, something really out of the ordinary (although not so far out there that it's verges into Fear Factor territory, i.e. fetal duck egg). Most of all, I thought it was delicious! And cheap to boot. Each dish cost under $7. Hi Elmo - A very nice review. I felt as if I sat next to you eating, tasting, and sweating through each dish. Like the comment you just left on DG re: Korean food, my knowledge of Indonesian food is limited, but I continue to be educated about Indonesian food thru your blog. Thanks for the great review! And you would've gone through about a 3 inch pile of napkins! That was one of the spiciest meals I've had in a long time. Although I'm no chili-head, I like the occasional burn of a good capsicum-laden meal. Glad to do it! Indonesian is rare to find around these parts. I hear Philly has a bustling Indonesian population and lots of restaurants to feed it. L.A.'s got a spattering of restaurants here and there, and the closest Indonesian restaurant to Orange County? Yep. You guessed it. Toko Rame (pronounced "Toe-ko Rah-May"). Shame there isnt more Indonesian places in the OC...or rather, any. I had some indonesian food in westwood a couple of times, the name escapes me but it gets a lot of praise. Thought it was pretty darn good. Even bought some sambal to take home. I might have to make a trip back now that I know so much more about the cuisine. Thanks! I can't agree with you more in wishing there was an Indonesian restaurant in O.C. There was one once called Asian Deli, but they moved to Diamond Bar. I think the one you tried in Westwood is called Ramayani. Heard that was a good place, but I've yet to try that one, but then I've yet to go to Westwood in a long time. mmm.. it's true. indonesian/singaporean food is so hard to come by in orange county. i've only been able to find a few in san gabriel (i travel far for roti prata). straits in sf is still my fav though..
p.s. i think i butchered the spelling on the roti. The San Gabriel area's got two Indonesian places, and at least one Malaysian place...I envy them! Of course Indonesian restaurant mecca (at least in terms of quantity) is West Covina. There's about 4 within a block of each other at the Hong Kong Plaza! I need to do a review on Laotian food very soon -- it's delicious. Totally! This place would be a perfect fit for adventurous eaters who aren't put off by funky food and even funkier surroundings. Elmo, i'm up for that or prof. salt's original suggestion of Burmese (Myanmar) food. Ahh The Golden Triangle. How long I'ev been waiting to try thee.. Thanks for the mention! And thanks for visiting! i've actually been to the golden triangle in downtown whittier. i thought the food was mediocre, but then again this was when i first started college & hardly knew a thing about good food.. oh and i think it was advertised as thai not burmese for some reason. What a wonderful post. It's a perfect read particularly since up here in Toronto, Ontario, Canada it's below freezing, bleak and grey. Thanks for transporting me to Indonesia - even if it's only for a few minutes. Hmm...I'm starting to think Golden Triangle isn't as great as I heard it to be. Yours is the second negative I read on the restaurant. Thanks for visiting! A hot, spicy, meal from the tropics would certainly hit the spot in such a cold climate! I wonder what would happen to me if I ate this meal in temperatures below zero. Would my beads of sweat turn into icicles? Hi Elmo..I just posted comment on Kaki Lima's review. As an Indo's girl, am proud to see Indo's cuisine posted in your site, knowing not alot of people have tried our Delicious cuisine..(bragging) LOL. You really do go places..:o) How about try another Indo's place in West Hollywood calls "Indo Cafe" and it's pretty good too. Well, so far I like your site and been calling my friends to check out yr site since all of them like to go places too. Btw, Looking forward to see you try and give reviews on these two eatery place "Pink's Hot Dogs" in Hollywood and "Hot Dogs's vendor" in the front of Avalon (club) in Hollywood ..this is the best hot dog after clubbing..yum!! Welcome to my blog! And thanks for telling your friends about me. I haven't tried Indo Cafe, because it is simply to far to drive for me. But someday I will. I've eaten at other Indo Places, like the new Ramayani and Janty Noodle. I'll review them soon. If I ever get out to Pink's, I'm going to have to review them too! This is such a great blog! Thank you for taking the effort to share your food 'findings'! This is my second day in Irvine, so I am naturally feeling quite lost... But I am sure your blog will give me a good kick-start and an insider scope of the local scene. Please keep me posted if you guys are going for an eat-out! Cheers! I just discover this post and it's over a year old. Do you know if the restaurant still exist? Welcome to Irvine and my blog! Sorry for the late reply. Hope you've found good eats since then. Toko Rame is still kickin! Don't miss the Nasi Bungkus! Hey Elmo, this morning some friends who came from San Jose n stay @ Irvine called me asking where they should have dimsum close by. I just moved to LA from Atlanta abt 5 mths ago, therefore i'm not familiar with restaurants @ OC. So, i googled 'dimsum' and your blog came up! of course, i suggested them China Garden :) i trust you! in a way.. Anyway, im surprised to find out that you are Semarang-nian! Wes lama tinggal ndek sini? Hope your friends liked China Garden! I'll have to keep that in mind the next time I'm up there. Of course, the last time I found myself there was two years ago! I'm notoriously L.A. phobic. Maybe it's time. Wow, I've been reading your blog but not recently until I read this old post did I realize you're also Indonesian!! I haven't made the trek down to Bellflower myself but am definitely planning on it soon. Terimah Kasih for this article!! I've just discovered this while google nasi bungkus and glad I did. I miss Indo food a lot and have recently just posted a post about food I ate while in Bali (I have a travel blog). I will have to try this place out!! !